New Delhi : India and Germany have signed a Memorandum of Understanding (MoU) on Security Cooperation, here today. The Minister of State for Home Affairs Kiren Rijiju and the visiting German Parliamentary State Secretary at the Ministry of Interior, Dr. Gunter Krings signed the MoU. They have also signed the Joint Declaration of Intent on Cooperation in the field of Disaster Management. On this occasion, Rijiju said that the MoU on Security Cooperation has created strategic initiative between India and Germany in the area of Security Cooperation. The MoU proposes to intensify the cooperation in countering terrorism in all its form, including recruitment, financing, terrorist propaganda, training and terrorist movements; countering organized crime, preventing and combating unlawful production/extraction of any narcotic and psychotropic substances. The MoU also covers areas of border protection, aviation security, cyber crime, illegal migration and counterfeit currency. Under the umbrella of this MoU, there will be exchange of information, technological expertise and cooperation on basic and advanced training of security. The Joint Declaration of Intent on Cooperation in the field of Disaster Management seeks to deepen and develop cooperation in the field of Disaster Management through exchange of information, processing technologies and other Scientific/Technological expertise in the field of Disaster Management, as well as providing training and capacity building of First Responders in Civil Defence, urban search and rescue, Fire services and medical field. 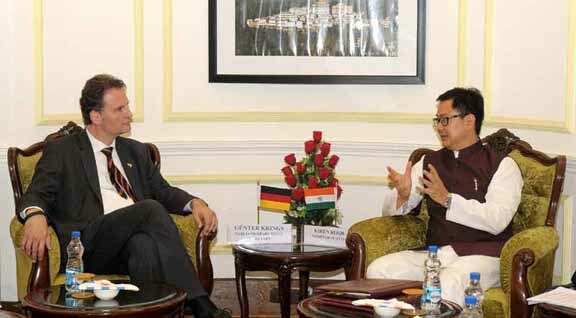 Rijiju also expressed hope that Germany will overcome its reluctance on inking the bilateral Mutual Legal Assistance Treaty (MLAT) which will pave the way for the deportation of criminals. Dr. Gunter Krings praised the remarkable economic growth of India and termed the two agreements as remarkable milestones in the relations of the two large and responsible Democracies of the World. He hoped that the German Ministry of Justice will find ways to rework the legal instruments for addressing the issues of bilateral Mutual Legal Assistance Treaty (MLAT). The two sides also discussed the activities of Sikh radical groups in Germany. Senior officers of the Ministry of Home Affairs (MHA) and Melanie Bavndamm of the German Federal Ministry of the Interior were among the dignitaries who attended the signing ceremony in the MHA.